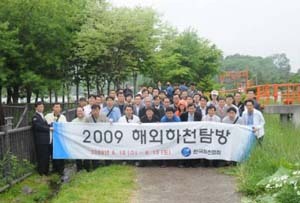 From June 10 (Wed.) to 12 (Fri.), 2009, an technical mission of the Korea River Association (53 members) came to Japan in order to observe river improvement work, flood control projects, and the river environment in Hokkaido, mainly in Sapporo City. The Korea River Association also serves as the secretariat of KRRN, which is a contact organization of ARRN in Korea. The JRRN Secretariat offered cooperation to the association, including schedule coordination with each river management agency regarding visitation sites and preparation of explanatory materials, and also accompanied the group on observation tours to the Moizari River in Eniwa, the Ishikari River, the Toyohira River and the Chitose River. The site visit to see advanced flood control projects, flood-control measures in urban rivers, and recreational water facility plans in Japan provided an opportunity to publicize the technology used and measures taken in Japan, and to exchange opinions on river restoration between Japan and Korea. We hope that it will add momentum to promote further exchanges between Japan and Korea in the field of river environment restoration.